With Microsoft Teams live events, users in your organization can broadcast video and meeting content to large online audiences. 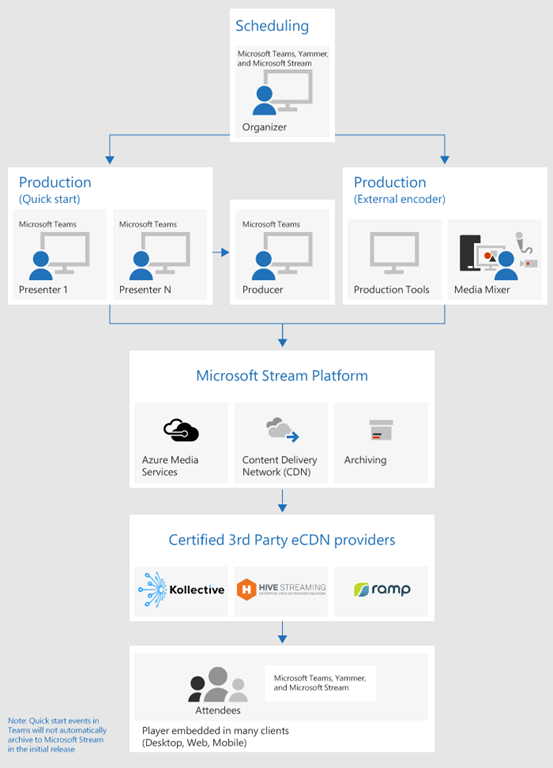 Microsoft 365 live events bring live video streaming to a new level, encouraging connection throughout the entire engagement lifecycle with attendees before, during, and after live events. You can create a live event wherever your audience, team, or community resides, using Microsoft Stream, Microsoft Teams, or Yammer. Teams delivers chat-based collaboration, calling, meetings, and with live events, so you can expand the audience of your meetings. Teams live events is an extension of Teams meetings, enabling users to broadcast video and meeting content to a large online audience. These are meant for one-to-many communications where the host of the event is leading the interactions and audience participation is primarily to view the content shared by host. The attendees can watch the live or recorded event in Yammer, Teams, and/or Microsoft Stream, and can interact with the presenters using moderated Q & A or a Yammer conversation. Teams live events are considered the next version of Skype Meeting Broadcast and will eventually replace the capabilities provided in Skype Meeting Broadcast. During the public preview release of Teams live events, we will continue to support Skype Meeting Broadcast, with no disruption in service for new or future events. However, we encourage you to try out Teams live events to leverage all the new and exciting features including screen sharing, attendee count, and support for external hardware/software encoders. Take a look at how you can use Microsoft Teams Live Events to broadcast video and meeting content to large online audiences.